If you’re like many Canadians, your credit card debt has probably been on a steady incline for some time – and the holidays won’t have helped. According to TransUnion, Canadians’ credit card debt averages $4,154. With 63% of Canadians buying holiday gifts with their credit cards, that amount is likely to grow considerably in the new year. So, now might be a good time to consider transferring your balance over to a lower interest card. But with so many options out there, how do you know which card is right for you? There are several cards on the market that offer low introductory rates for short periods of time, very low rates for longer periods of time and surprisingly low rates indefinitely. The best card for you will depend on how long you think it will take for you to pay off the balance. There isn’t much point in getting a low introductory interest rate if, after six months, you’re paying 21.99% on a huge balance. Although there may be many appealing introductory offers out there, it is important to read all the fine print. In this post, we’ll take a look at some of the best credit cards that can help reduce your interest payments with low balance transfer rates. Please note, these numbers were pulled as of January 2019, but offers do change, so be sure to check with each financial institution before you apply. The cards with the lowest promotional rates for the longest periods can save you the most in interest. Some of these cards also offer rewards, which can save you even more money. MBNA’s True Line Gold Mastercard offers an introductory rate for balance transfers of 0% for six months and the lowest credit card interest rate of 8.99% after the promotional period. However, it does have an annual fee and balance transfer fee. The Best Western Mastercard has a great intro rate of 1.99% for the first 10 months, but this leaps up to 19.99% afterwards, plus there is a balance transfer fee. RBC has two cards that offer great intro rates for lengthy periods, with no annual or balance transfer fees. While the RBC Visa Platinum Card offers an intro period of 30 months (easily the longest offer period of any card we looked at) its promo rate is high at 5.9%. The RBC Rewards+ Visa Card has an intro rate for 10 months of just 1.90% and delivers the greatest savings over a year. We made the following table based on the assumption of a $5,000 balance for a full year and included costs of interest and the respective annual/transfer fees. As you can see when comparing these four cards to an average credit card with 19.99% interest, you could be paying less than a third of your current interest charges. If your debt is just too high to pay off in the short term, but you are confident you could pay it off within two and a half years, the RBC Visa Platinum Card is the best card on the offer outlined above. Its rate of 5.9% is the lowest over 30 months. If you switched your $5,000 balance from a 19.99% credit card to the RBC Visa Platinum Card, and kept that same balance, you would save $1,761.25 in interest over the 30-month period. For credit card balances that you expect you may need a longer period to pay off, the credit card with the lowest long-term interest rate is the best option. While the MBNA True Line Gold Mastercard has the lowest rate currently available (of the options shown above), it does charge an annual fee of $39. The American Express Essential Card also offers the low interest rate of 8.99%, but has no annual fee. If you were to keep a $5,000 balance over five years, with your regular credit card of 19.99% interest, you would pay $4,997.50 in interest. With MBNA True Line Gold Mastercard, accounting for their introductory rate, balance transfer fee and annual fee, you would pay interest and costs of $2,267.75. However, with the American Express Essential Card there are no annual fees or transfer fees, so you would only pay $2,072.50 in interest. This would save you almost $3,000 in interest over five years. If you are struggling to keep up with credit card bills, there is an option that helps you to clear all your credit card debt with no monthly payments to make. 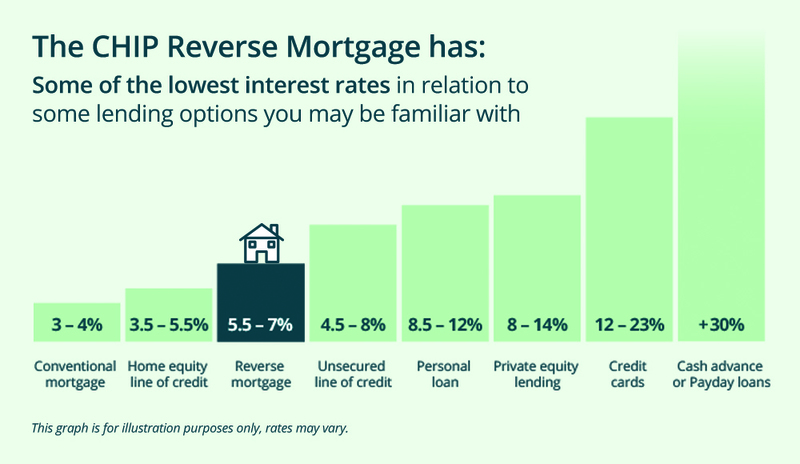 The CHIP Reverse Mortgage® allows homeowners aged 55+ to cash in some of the equity of their home, which can be used to pay off debts (like credit cards). While you can choose to make interest payments, you don’t have to. This can reduce your monthly debt payments to zero and really boost your retirement income. A reverse mortgage is a great financial solution that can help Canadians pay off or consolidate their existing debt. Not to mention, the interest rate is considerably lower than even the best credit card rates in Canada. If you’d like to offload your high interest credit card debt and rid yourself of monthly payments, contact us at 1-866-522-2447 and find out how much tax-free cash you could access.